WhatsApp has activated real-time location sharing feature for users, joining the likes of Google Maps and its parent company Facebook which also enables location sharing feature for specific duration. The popular chat service announced that starting today, users of its iOS and Android app will have the option to share their live location with family and friends for a set period of time. Users can also turn off location sharing whenever they choose. Go to the Attach button and select Location. A new option for "Share Live Location" will appear, allowing you to share your location for 15 minutes, 1 hour or 8 hours. Tap on Send, and your location on a map will be live. As is the case with all WhatsApp communications, Live Location is end-to-end encrypted, so only those in a chat can see it. If multiple people are sharing where they're at, each person's location will be visible on one map. 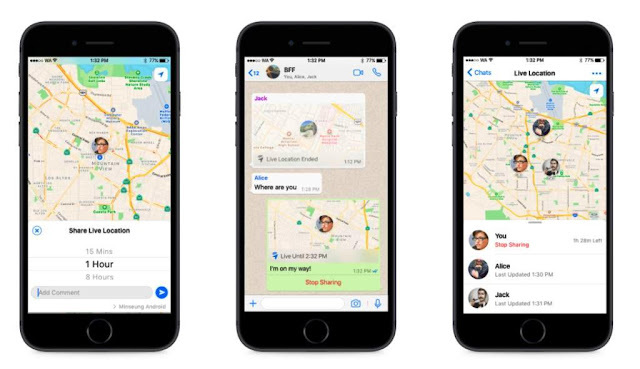 Facebook Messenger also has a Live Location feature, which lets users share their location with friends for up to 60 minutes.